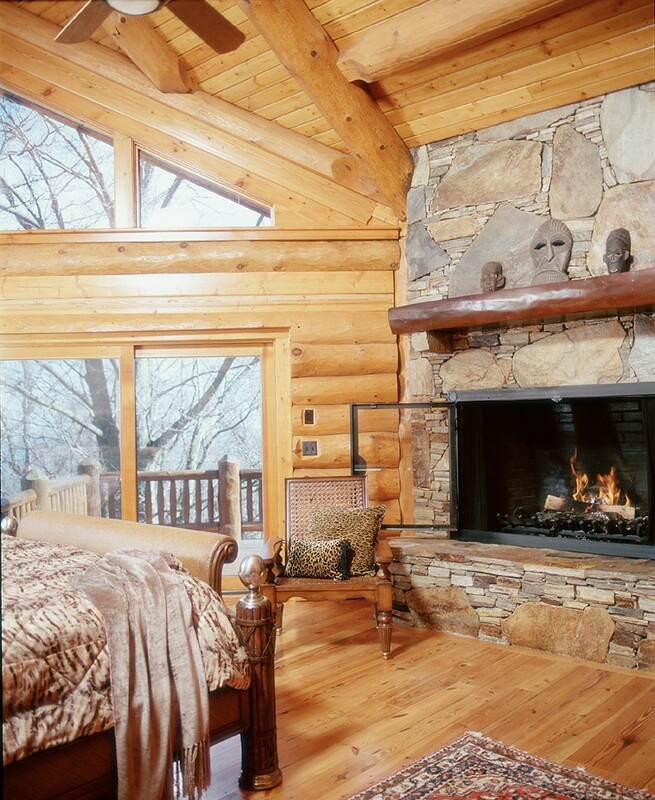 High in the mountains of North Carolina, set amid 200 acres of hills and peaks, and surrounded by national forest land, is a log house that can only be described as grand. Although its architecture is contemporary, the house was designed with a sense of timelessness to last hundreds of years. To assure its longevity, the homeowners built their impressive structure almost entirely of natural materials. This house is about logs, stone, glass, wood and mountains. Containing 14,000 square feet of heated space, including an attached garage, the four-level structure features seven bedrooms and seven fireplaces of Carolina rose stone. Requiring 19 tractor-trailer loads of logs weighing a Guinness Book-like total 760,000 pounds, it took three years to complete. 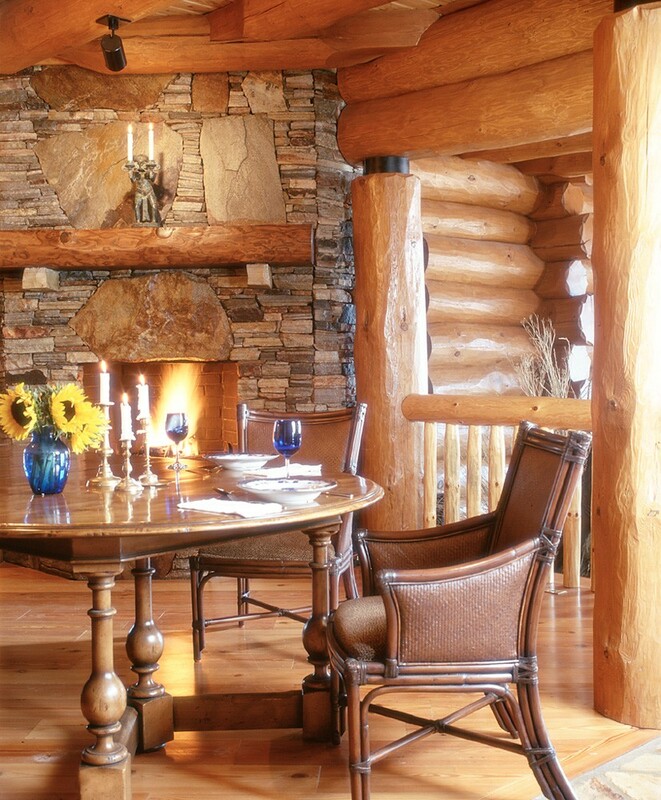 The round logs that make up the walls are from Bullock & Company Log Homes of Ontario, Canada. 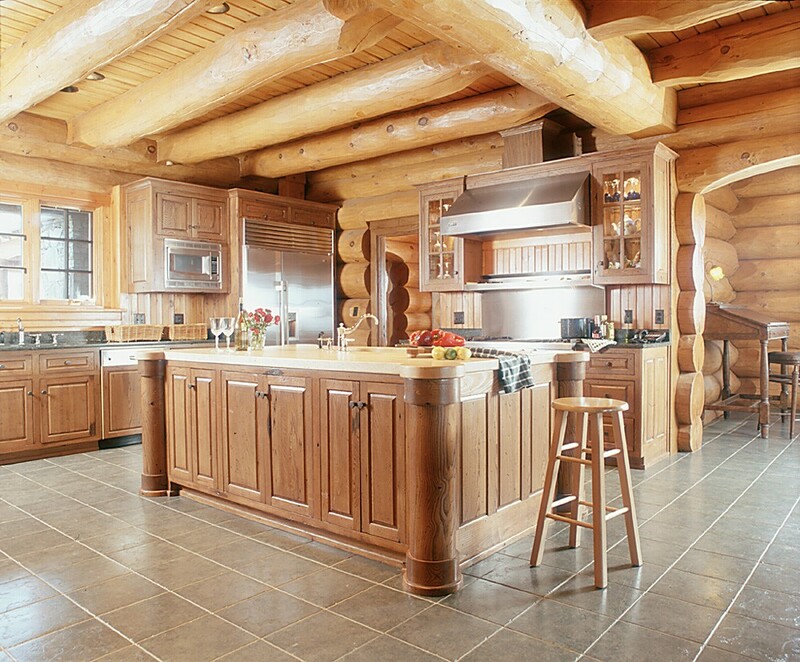 Owner Tim Bullock, who has been designing and building handcrafted homes for the past 27 years, says that the logs are of a style, size and proportion rarely seen east of the Mississippi. They are slow-growing Northern white pine from Ontario, with diameters running from 12 to 28 inches. All were graded by the Bullock team and hand-scribed with a modified saddle notch. No chinking interrupts the gleaming solid wood walls. 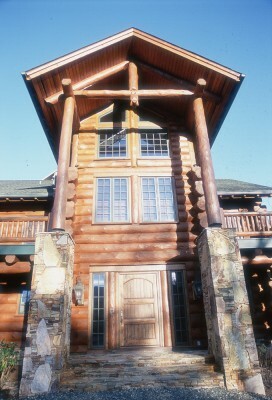 Enter through the massive handcrafted front door, created by Appalachian Woodwrights of Morganton, North Carolina, and the boldness of the house design is immediately apparent. The first view of the interior is through a long entrance hall across the width of the vast living room and directly out the bank of floor-to-ceiling windows onto spectacular mountain vistas. The visual impact of a hundred miles of wilderness seems to make the house and its environment blend into a single entity. This is pure architectural drama. The living room features a massive stone hearth and fireplace, large upholstered couches, club chairs and ottomans for comfort. Beyond that, there is absolutely no decor clutter. It is a grand space to enjoy the fire and the view, to read or to talk. This is exactly the effect that the homeowners had in mind. On the same level, to the right of the front door, is a smaller room. The family uses this space as a combination library, video room and game room. Each level of the house is customized to suit the family's taste. 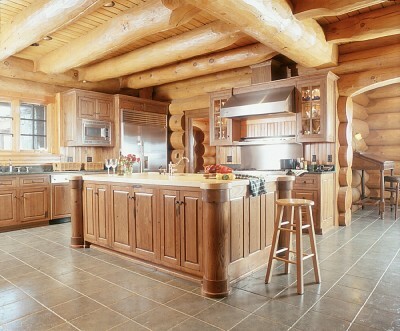 There are two kitchens, for instance. The first, on the entrance level, is used to prepare everyday meals. It has a large eat-in area with a long pine table set in front of a giant hearth and features wormy-chestnut custom cabinets by Banners Cabinets of Newland, North Carolina. The second kitchen is located on the lower level. The homeowner, a physician by profession whose avocation is the martial arts, took an active role in designing this family retreat. He was very specific in what he wanted. Among the special features to be included, for instance, was an extensive martial arts studio, known as a dojo, which was set into the lower level of the house. Here, he hones his own skills and teaches students. The homeowner drew a rough design of his ideas and gave them to Tim Bullock, who then worked with the family and created building plans for the house. Construction began in 2000 and was completed in 2003. Mountain Construction of Boone, North Carolina, was the contractor. Mark Kirkpatrick, the owner of Mountain Construction, was invaluable as the general contractor because of his experience handling large, complex projects such as this one. "Mark is a true craftsman and a delight to work with," Tim says. The homeowner's goals for the house remained consistent throughout the project. "We'll probably continue to use the place as a weekend and vacation retreat, as opposed to retiring here and using is as a full-time home," he says, adding that, "children, parents and friends all spend time there." In keeping with the family compound it was meant to be, the seven upstairs bedrooms provide ample enough space for a good sized crowd. The decor in the bedrooms carries over the design philosophy of the rest of the house. Furnishings are simple and spare; it is the astounding view of North Carolina mountains and the logs incorporated into the house that define the aesthetic experience. The homeowner knows well that what one can comfortably lift or climb in youth can become a great deal more challenging with the passage of time, so he designed this multi-generational house for all ages. He installed an elevator, for instance, so that everyone can easily move from level to level throughout. A dumbwaiter that hauls logs up to fireplaces was installed for the same reason. 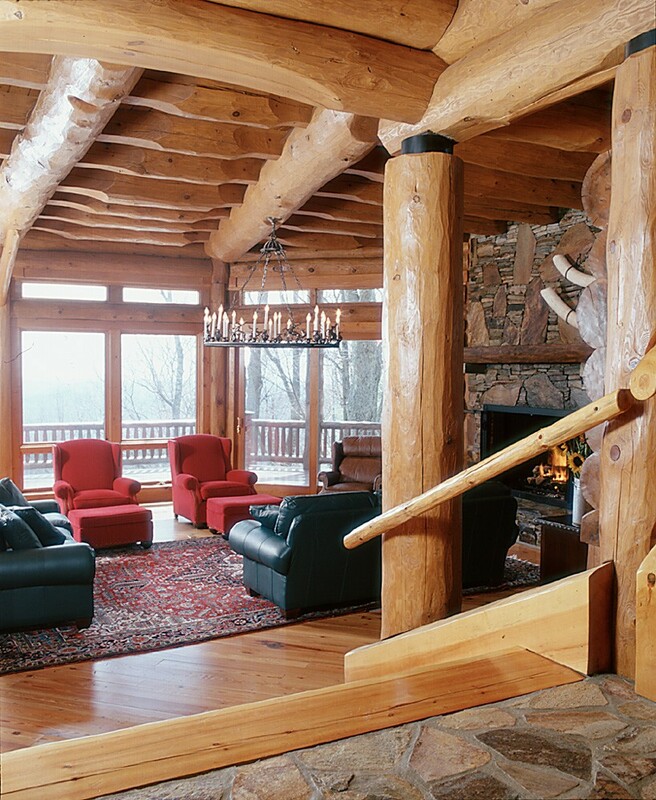 The sense of strength and permanence given off by the house offers a feeling of sanctuary, at least partially because of the dominating character of the logs that surround and support it. 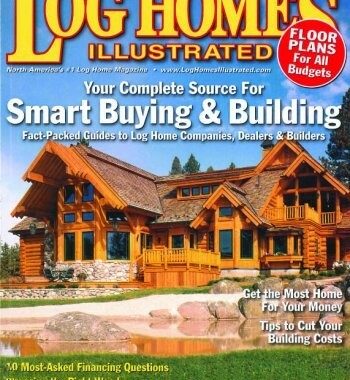 The homeowner has often commented that there is little he likes to do better than simply sit and enjoy the look and feel of the individual logs in the massive walls of his house. Beyond appreciating the boldness of the structure, the homeowner has also gone to great effort to ensure that the house provides every comfort. He installed more than ample heating and cooling mechanics and redundant systems for all of them. This house has five propane furnaces and cooling elements on five different zones. There are five 80-gallon water heaters, all of which are backed up by a V8 600-amp propane generator. Besides being designed for comfort, the house, for all of its considerable size, is relatively low maintenance. Hurd windows are wood inside and aluminum clad outside. The logs were sealed and protected with an environmentally compatible coating by Sansin. On any given weekend, the homeowner, his wife, their three children and multiple guests are likely to be found riding the mountains on their ATVs, practicing their shooting skills on the range near the house, hiking the hills with the two family dogs or just relaxing in the hot tub. This house defines family getaway now and for generations to come. Mountain Construction does custom home building in any building style, including conventional new homes, remodeling and restorations, log and timber frame home and structural insulated panel homes. For more information or a FREE INITIAL OFFICE CONSULTATION please CONTACT US.